Sunny Corner01485 534267work Self-cateringSleeps 4 in 2 bedrooms, 1 double and the other with adult bunks. Visit England 3 stars. Duvet. No bed linen/towels. Elect incl. TV/DVD. Microwave/grill. Fridge. Washing machine. Garden furniture. Gas BBQ. Friday start. This modern bungalow is situated at the end of a block of four properties on the outskirts of the town only a few minutes from the sea front, promenade and beaches of Hunstanton. The town centre with its selection of shops, bars and restaurants is just a minutes’ drive away and there is a supermarket close by. 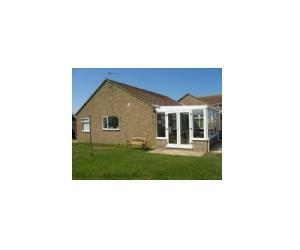 The property has partial night storage heating and laminated flooring throughout. There is large, fenced communal garden to the side of the property which is ideal for children. Parking space for one car. Comprising; entrance into large conservatory with table and chairs. Entrance door to sitting/dining room with sliding doors to fully fitted modern kitchen, having electric cooker, microwave/grill and washing machine. Sleeps 4 in 2 bedrooms, 1 double and the other with adult bunks. Two bedrooms, one with a double and the other with adult size bunk beds. Bathroom with bath (shower over), washbasin and WC. From King's Lynn on A149 to Hunstanton. Nearest train/bus station is King's Lynn.